Yes! You're at Hudson's Adventures! We are in Maryland, and I'm TRYING not to work. So I took a few minutes to change our blog's format tonight. Let me know what you think! It was cute but a little busy, so I decided that like the rest of my life, I needed to SIMPLIFY! So I thought I'd post a few pictures for your holiday enjoyment. This is our fabulous play group. Can you believe we have one member that is a year old already (Sweet Nora in the front right)? We all got together for a holiday party, and it was so much fun chasing everybody around! Lindsey and Ella (in pink) were great hostesses! Here's Hudson and his buddy John. They love playing together! This is Hudson's auntie Melinda. She loves her some Hudson! We went on a family outing to New Braunfels to see the lights at Shliterbahn. Beautiful! For Thanksgiving, we celebrated Christmas with the Wescott clan in Midlothian. So fun! And finally, I can't believe I haven't told you about music class. It's been fascinating to see Hudson in this environment! Here's our first class. He LOVES the shaker eggs. But he thinks the maracas are especially delicious! Funny story: There is a slobber bucket in each class where you put the instruments that your child slobbers on. Hudson wins the prize for the most instruments in the bucket every time! (OK, there is no prize, but I'm just making myself feel better.) I guess our sweet teacher Larisa was trying to make me feel better too, because she noted that Hudson is eating on the instruments TO THE BEAT OF THE MUSIC! Ha! Do you think she's a pro or what?!? We'll upload a few videos soon, but enjoy these photos in the meanwhile. And happy holiday! that matches his Hudson sweater. Too cute for words! It's official; Hudson completed his first swim class at the YMCA. side of the pool. Very fun! mirror to admire one's handsome self. :) Have a great day! As you know I am a hit with the ladies. Mommy is the lady that loves me the most and is so nice to me. To prove it she likes to let Miss Christine take me so many fun places so that the ladies can get a good look at me. I used to only go to super fun places with Mommy and Daddy but now Miss Christine can use Mommy and Daddy's car to take me to all sorts of fun places too. For me that means more time to flirt out there in the world. 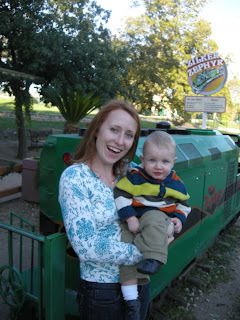 Miss Christine took me to ride on a special train The Zilker Zephyr. It was so much fun. Everyone waved to me as I went past them.I tried to watch the trees and shrubs as we moved by them but my eyes couldn't move fast enough. It made Miss Christine laugh and laugh to see me try to hard at it. I wanted to just ride and ride but Miss Christine said we had to go! She wouldn't just let me sit in the back seat without my chair but in this picture below she let me lounge for a minute before she put me in my car seat. Ahh, it sure felt good to just sit back and relax after a long train ride. I know I am a handsome boy but I am not so sure I wanted Miss Christine to take this picture. Hopefully the ladies will just think it shows how laid back I am. I am off to have some more fun! All aboard, because this train is leaving the station. What's all the excitement about I'm just standing here. :) Hudson now stands for about 4 or 5 seconds on his own and typically just let's go when he is busy trying to get something to put in his mouth. 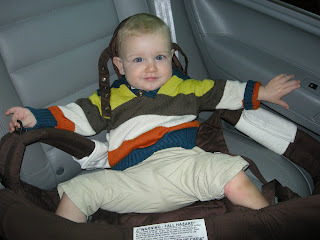 Bigger and Bigger - at his 9 month checkup, Hudson was 29.75" long (90th %tile) and 21.3 lbs (60th %tile).